The Outside dunking story is finally online. Now it can be told. 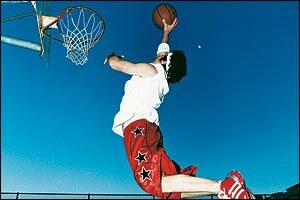 The Project, referenced here as such for the last half-year, is my quest to dunk a basketball on a regulation hoop. I wrote a story about my initial six-month upward push for Outside Magazine. It's not available online yet, but the workout is. Mad props to Gil and to Mark Lobl, who worked with me a ton in the weeks before the 6-month dunk attempt. That's right, attempt. But the Project continues. Started on Olympic lifts today, getting back into full-on training mode. Early a.m. - 9 laps on the Kezar track w/ Mags. Mags helped me untangle a knot in the plot of the short story I'm working on.